Welcome to Searching for Texas. To find what you're looking for, search by region or have a look at the tag cloud for favorite activities. The tag cloud can be found in the upper right corner of every story page if you're using a desktop, toward the bottom of every story page if you're using mobile. A Norwegian's search for the landscapes, public spaces, and historical events that define and shape Texas. 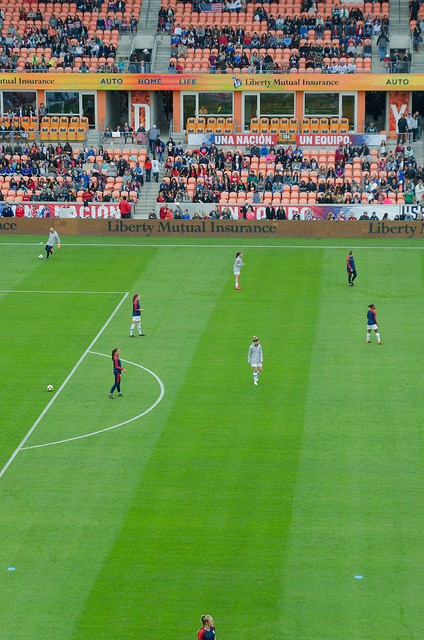 Houston’s BBVA Compass Stadium is my kind of arena. It seats 22,000 people which, compared to some of the supersized venues, makes for a less intimidating crowd experience. 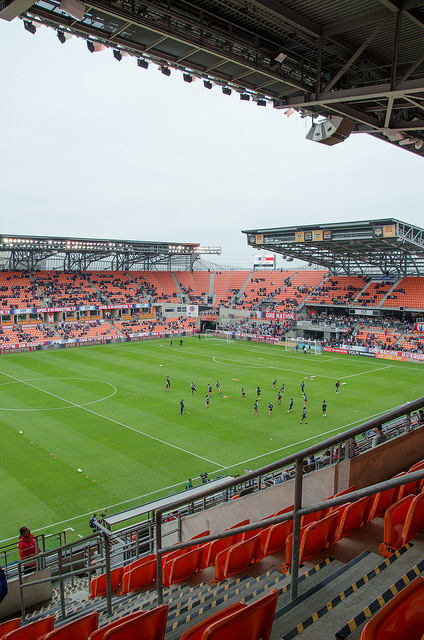 It’s a relatively recent addition to the Houston sports scene, having been completed in May of 2012, and was built to provide Houston with a place to enjoy soccer. 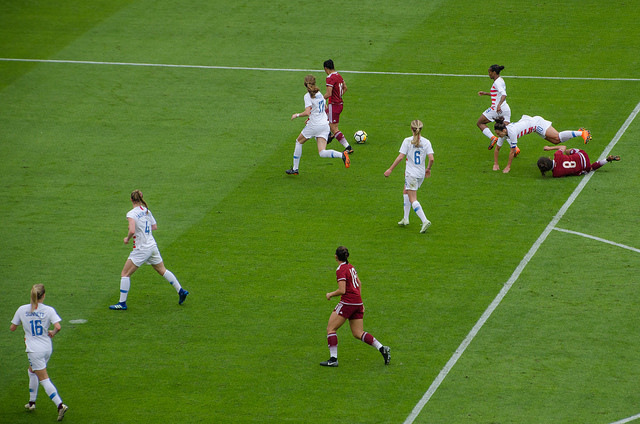 The stadium is home to the Houston Dynamo team, a men’s major league soccer club, as well as the Houston Dash of the National Women’s Soccer League. When my significant other discovered last month that the US Women’s National Soccer Team would be playing against Mexico here in Houston, he was quick to order some tickets. Neither one of us are huge soccer fans but this was a great opportunity to try something new. For me, it offered my first opportunity to do some sports photography. Our seats were near the top of the stadium so when the two teams entered the field, the players were rendered in miniature. As the teams went through their warm-up practice, I kept wondering if I’d misunderstood something—the players looked like kids, though I realized they had to be teenagers at least. It turned out to be an illusion created by the distance to the field. Before the game began, each player was introduced on a large screen and I was surprised to find several of them were in their thirties. I would have expected the American team to have the largest number of supporters, but that wasn’t the case. The teams were equally encouraged by their screaming and cheering fans, which made for a great spectator experience. 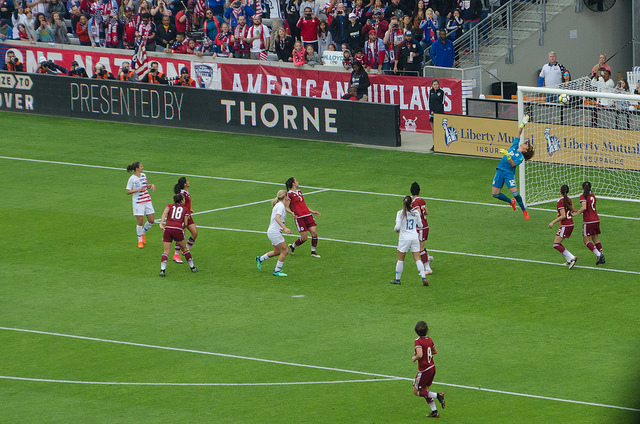 Soccer really is a fun game to watch! If you’re looking for something to do in Houston, have a look at the Dynamo or Dash schedule of games. The tickets are inexpensive and even if you’re unfamiliar with the game, you’ll quickly figure it out and get into the spirit of things. I'm so glad you've decided to visit my blog! I'm Marianne Pfeil, a Norwegian who has chosen Texas as my forever home. This is a state full of surprises and whether you live here or are just planning a visit, I hope you'll use this blog as a source of ideas for some fun experiences. At the beginning of every month, you'll receive a newsletter which will tell you a little about what I'm up to behind the scenes. You'll also receive a convenient list of the previous month's stories. I appreciate your trust in allowing me to reach you by e-mail. The blog's e-mail list will only be used when the newsletter is sent to you. Thank you for your interest in Searching for Texas! You'll receive an update at the beginning of next month.